Published: Sep 2018 i Previous editions(s) can be found in the Related Items tab. Volume 2, the Case Authority, includes thousands of case summaries of decisions under the rules, arming you with the latest evidentiary resources to help you prevail at trial. 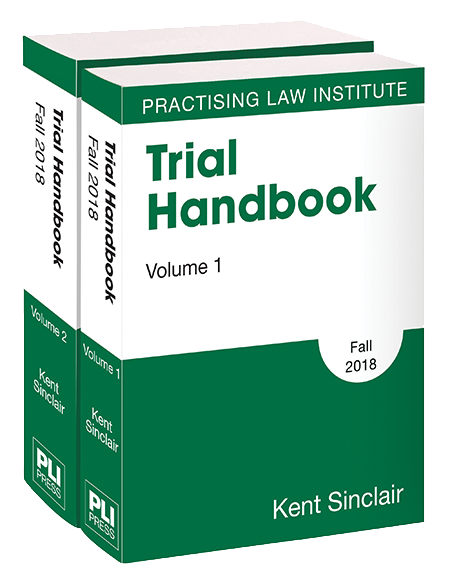 Trial Handbook also comes with a USB flash drive containing the entire text of both volumes. Kent Sinclair is Professor of Law at the University of Virginia School of Law, where he is also Director of Lawyer Training. He is a member of the New York, California, Virginia, and federal bars and received his law degree from the University of California School of Law at Berkeley (Boalt Hall), where he was Chief Note and Comment Editor on the California Law Review. He served as law clerk to the Honorable James R. Browning on the United States Court of Appeals for the Ninth Circuit and was acting Chief Screening Attorney for the Circuit. Thereafter he practiced with Shearman & Sterling in New York City, specializing in complex civil litigation, largely in the federal courts. He has been Adjunct Professor of Law at Fordham University School of Law and has taught numerous courses in pretrial and trial procedure for the Practising Law Institute as well as for the Federal Judicial Center. He is the author of several law review articles, Federal Civil Practice, and the PLI pamphlet Federal Rules of Evidence at a Glance. From 1976 to 1983 he was a United States Magistrate, sitting on the United States District Court for the Southern District of New York.